Imagine a mouthwash with a soft, gentle feel containg a strong antibacterial enzyme system. A mouthwash that, instead of irritating contributes to their health. That mouthwash is Biotene. Only Biotene contains 4 antibacterial enzymes which boost the defense system normally found in your saliva. Together, they help protect your teeth and gums. 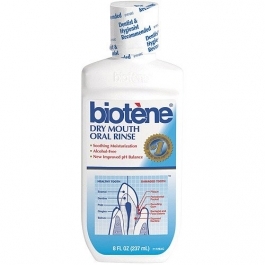 Biotene is especially beneficial to individuals experiencing dry mouth or having oral irritations. Naturally sweetened with Xylitol. Contains no saccharin. Alcohol-free. Cleans and refreshes without burning. Use approximately one tablespoon whenever desired. Swish thoroughly for 30 seconds and spit out. For best results, use with Biotene Dry Mouth Toothpaste, especially before going to bed.